Heat oven to 425°F. Line 15 standard-size muffin cups with paper baking cups. In medium bowl, stir muffin mix, milk, oil and eggs with spoon just until blended (batter may be lumpy). Spoon about 2 tablespoons batter into each muffin cup. Place about 1 teaspoon lemon curd on batter in each cup. Top with remaining batter, dividing evenly among cups. Bake 14 to 17 minutes or until golden brown. Cool in pan on wire rack 10 minutes. Remove from pan. Squeeze Glaze packet from muffin mix about 10 seconds (do not microwave). With scissors, cut off tip of 1 corner of packet. 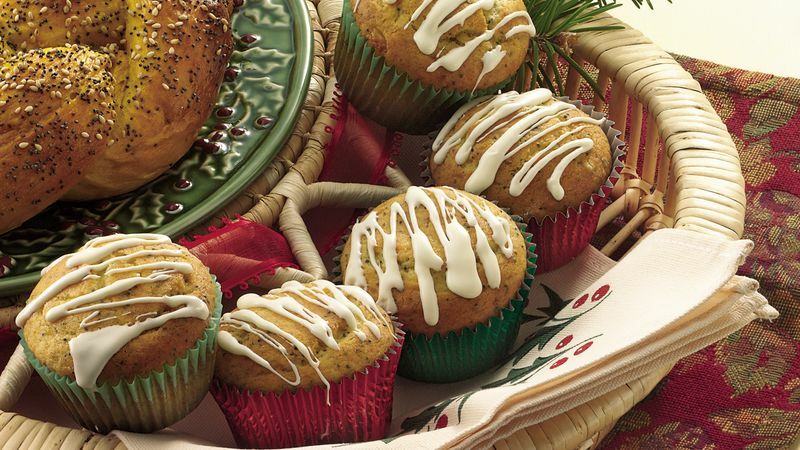 Drizzle glaze over warm muffins. Serve warm or cool. Lemon curd is a thick pudding-like product usually found alongside the jams and jellies in the supermarket. Lemon pie filling can be used instead of the lemon curd.